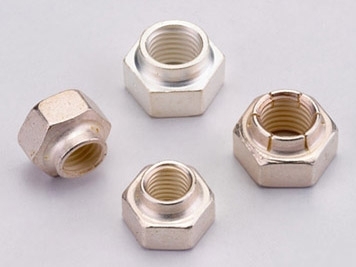 NAFCO produces high temperature and corrosion resistant lock nuts based on its manufacture background in aerospace fasteners. We utilize certified materials such as A286, AISI 347 and 302HQ stainless steels and other super alloys. In-house unique processes such as cold forming, hot forging, thread tapping, vacuum heat treatment, silver plating and dry film (NADCAP approved) will assure conformed quality under our AS9100 and ISO/TS16949 system. Nut Products are already used in American branded O.E.M. trucks. More New products will be developed through the cooperation with customer for automotive engine (power train), turbocharger and exhausting system.